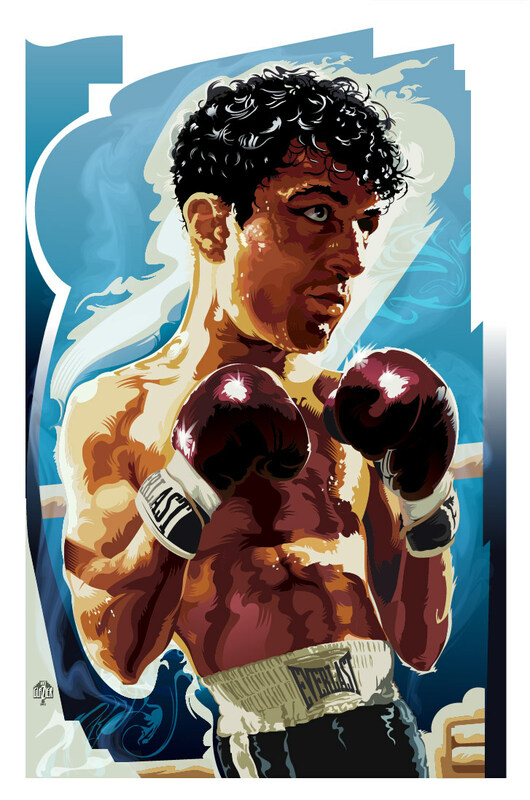 Garth Glazier - Robert De Niro, "Raging Bull". 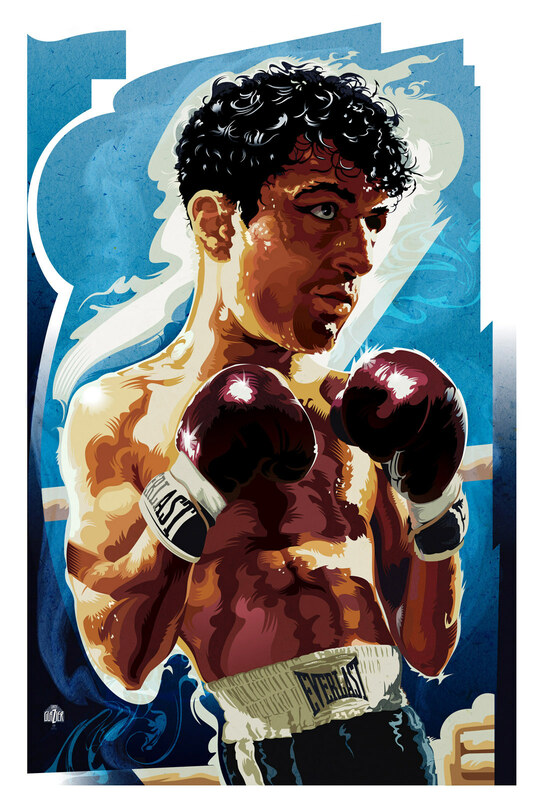 Robert De Niro, "Raging Bull". 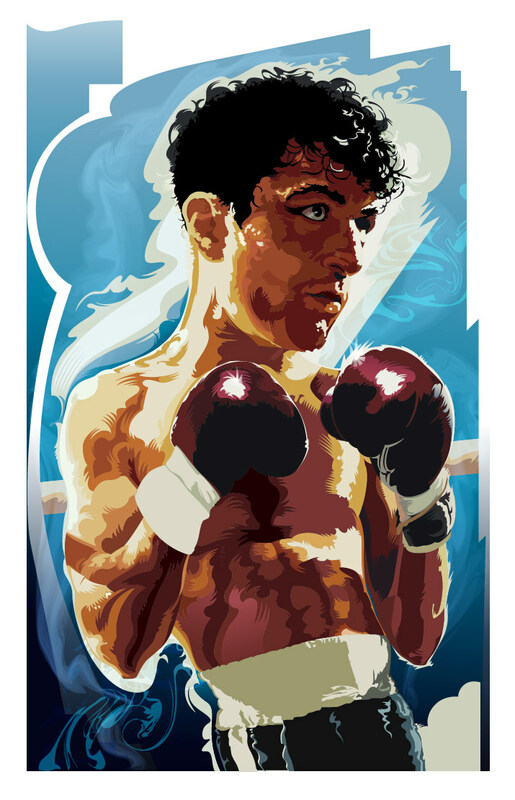 Robert DeNiro portrait of Raging Bull. This illustration is a still a caricature in the basic sense of distorting the body and exaggerating the size of the head, but the rendering is more in the style of a painting. I had to do a illustration of Robert DeNiro as Jake LaMotta. DeNiro worked out to beaf up his body for this role. The images of him from the 1980 film make him look like a real fighter. 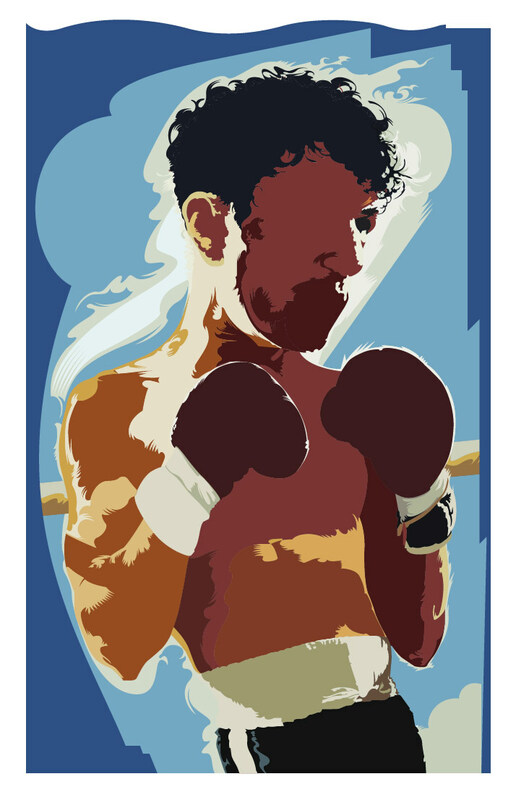 I built this illustration of Robert De Niro in Adobe Illustrator. I am beginning to re-introduce tonal changes like gradations into my work after several months of using only flat color. The progression of images below shows the art being constructed beginning with flat color and ending with gradations and textures. I normally paint portraits in full tone using acrylics, but I recently decided to take a break from painting and sharpen my design and color skills by using only flat graphic shapes. This has been a very useful exercise in that I was able to dispense with technique and focus on the design and the use of simple color choices to create dramatic images. Changing direction a bit on my portrait work. This illustration is a still a caricature in the basic sense of distorting the body and exaggerating the size of the head, but the rendering is more in the style of a painting. I had to do a illustration of Robert DeNiro as Jake LaMotta. DeNiro worked out to beaf up his body for this role. The images of him from the 1980 film make him look like a real fighter. I began by blocking in flat color areas to establish the overall look of the illustration. The design usually takes shape early in the process and hinges on some key shapes that inspire me. 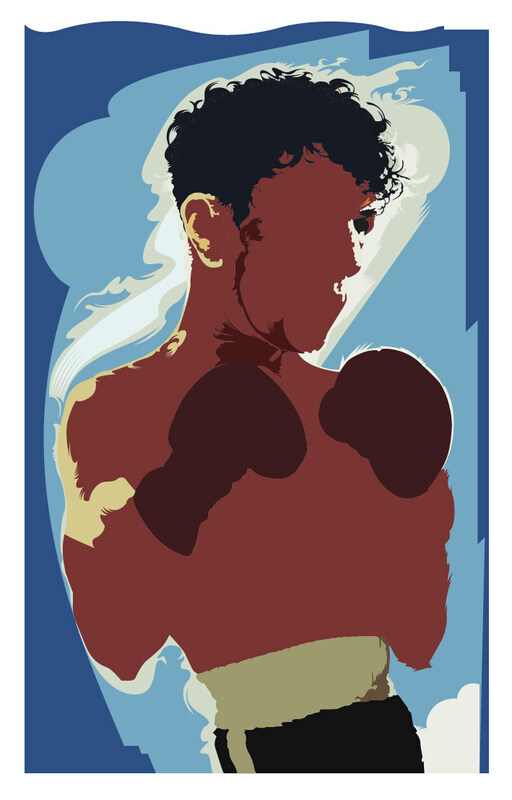 I continue with blocking in flat color areas on the figure. I sample color from my reference and then adjust to using the color palette until i have a narrow range of tones for the skin, hair, and cloths. You can see some of the stylistic touches creeping into the illustration. Jagged shapes and rounded sweeping forms are added to convey movement and drama. The smokey room atmosphere was created using a bristle brush and then the smudge tool to create the swirls. These shapes were set to screen to make them transparent. From this point forward it was a matter of completing shapes and defining the surfaces of his body. I wanted to make the light on him dramatic so I pushed the contrast between the highlights and the shadows. edge of the hair and create a dynamic sequence of curving shapes. Edges are extremely important to me especially as they define the person. Almost done at this point. The details of the boxing trunks and the "Everlast" logo have been added.